Longing to escape the Massachusetts hometown that has always blamed their family for whatever goes wrong, Gillian and Sally respectively marry and run away but are drawn back by a seemingly magical force. Reprint. NYT. 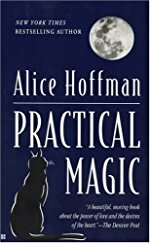 Author Alice Hoffman has recently revisited the lives of the Owens family with The Rules of Magic, a prequel to her 1995 book Practical Magic. Sandra Bullock, Nicole Kidman, Stockard Channing and Dianne Wiest starred in the 1998 film adaptation. I've just reread Practical Magic before diving into the prequel. The book stays primarily in and around the three-story house on Magnolia Street, where orphans Sally and Gillian are raised by their aunts (apparently great aunts) Jet and Frances Owens. "They were never told to go to bed before midnight or reminded to brush their teeth. No one cared if their clothes were wrinkled or if they spit on the street... They could climb onto the roof and sit perched on the slate peak, leaning back as far as possible, in order to spy the first star... arguing over whether it was feasible for even the smallest wish to ever come true...."
Of course, their greatest wishes were to have a place where they felt like they belonged, unconditionally. But being descendants of Maria Owens, in the town that still blamed her for all their shortcomings after two hundred years, this was almost impossible. But chance, or fate, or self-determination would take pragmatic Sally and free-spirit Gillian on a wide trajectory to love and death, lust and revenge, the streets of New York and the vast open spaces of Arizona, all the way back to the house of their childhood... and each other.